This recipe is based on Elena Amsterdam’s Bread 2.0, which makes a very satisfying Paleo bread (also check out her Paleo Bread recipe which omits arrowroot powder in favor of more eggs and almond flour). Her base recipe didn’t appeal to my oldest (who, as you know, is extremely picky), but I found that the addition of some seeds to mimic multigrain bread worked wonders. She loves it and one of the healthy foods I can count on her eating now is almond butter and honey sandwiches on this bread!
. I am using the same size here because it is a good size for even baking (especially with almond flour baking) and, since this bread is so filling, actually makes a really nice size bread slice. I haven’t experimented with scaling this loaf up to a larger loaf pan, but if you try it, please leave me a comment to let me know whether or not it works! 1. Preheat oven to 350F. Grease a 7.5″ x 3.5″ loaf pan very generously with coconut oil. 2. In a small bowl or measuring cup, combine arrowroot powder, almond flour, tapioca starch, salt, and baking soda. 3. In a large bowl, beat eggs with a handmixer until super thick and frothy, about 4-5 minutes. 4. Stir honey and vinegar into the eggs. Fold dry ingredients into egg mixture until well combined. Fold in sesame and sunflower seeds. 5. Pour batter into prepared loaf pan. Bake for 40 minutes. Let cool 10-15 minutes before removing from loaf pan. Enjoy! DoDo you need help finding any ingredients? 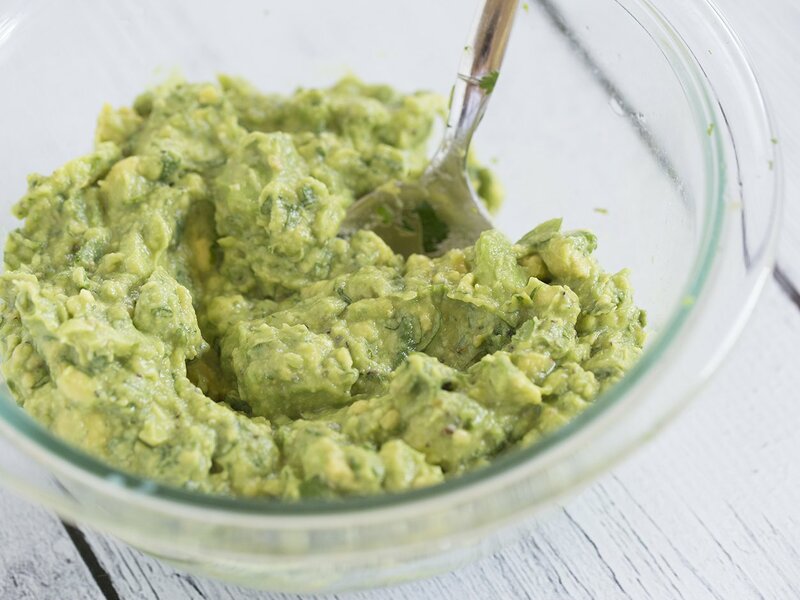 Check out Important Pantry Items for the Paleo Baker. That’s awesome!!!! It’s a hit with my family too. I just finished baking this and it was SOO good!! Being gluten free I’ve tried lots of bread recipes and this is probably the easiest and the best I’ve tried so far! Thanks for posting it!! I’m so glad you like it!!! I agree with you! Its the best one ive had also! I like having a little crunch that I used to get with the multigrain breads! So, I just started doing Paleo. My kids are doing really well, but they miss “easy foods” I wish I could come and hug you for this recipe. I added pumpkin seeds and sunflower seeds and omitted the sesame seeds. We all had a slice when it was still warm with honey butter and it was amazing. Today for lunch I made sandwiches and the kids were so happy! They even like that they are short slices. My daughter said, “bout time someone made kid size bread”. I love her. We ALL loved this bread. THANK YOU THANK YOU THANK YOU!!!! Thank you! 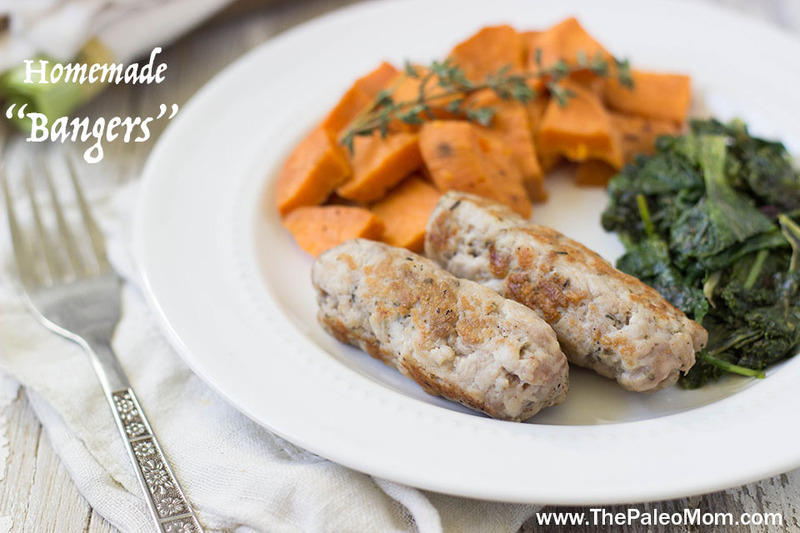 We still battle with the loss of convenience foods, which is why I work so hard to develop recipes to replace them! I’m happy to know they are appreciated! We are starting Paleo today, full force, all family! I’ve dabbled in it some, but I just cleared out our kitchen of all non Paleo and am hitting the store. Thank you for this simple recipe I cannot wait to try it out! And I love the comments that kids LOVE it! I just made this bread. I do not have the right loaf pan so I baked in 3 mini loaf pans for 29min. and it came out great. could have been taken out at 25min I think. so if you want to give this away or take a meal to someone. the disposable mini loaf pans work great fro this bread. hopefully ordering a real loaf pan this week. Do you have a substitute for the eggs? I have not tried any egg substitutes in this recipe. oh my goodness! This is delicious and it made the house smell amazing while cooking! Thank you! I can’t wait to have a nice thick slice of toast in the morning with some butter! Yumm! what could I substitute arrowroot powder for? a different type of flour (like hemp)? Sweet potato starch would work well. Tapioca would change the texture a bit but would work too. I’m not familiar with how hemp flour works in baking, so I don’t know. I think so. I would suggest slicing it before freezing. Can I substitute chopped almonds for the seeds? Any suggestions to replace the ground flax seed? Prof. Lorain Cordain uses ground flax seed in his cookbook. Any argument against flax seed would also apply to nuts, and I’m pretty sure this recipe wouldn’t work without the flax or the almond flour. If you are okay with almonds, but still want to avoid flax, chia seeds would be a very good substitute. Otherwise, you can play with adding probably 2 extra eggs and reducing the water. Hope this helps! Do you know the carb content in this bread? looks delicious…. What do you suggest to prevent tunneling in Paleo breads? 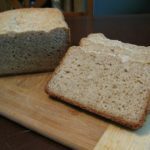 I bake a honey “wheat” bread from John Chatham’s book, Paleo Breads, and it always tunnels, leaving an unbaked soft batter in the center and a “caving-in” of the top of the loaf. Smaller loaf pans, lower temperature and/or longer cooking times. Thanks much. I use the small 3 x 7 loaf pan and have tried longer cooking times. I have always used the 350 degree oven temp suggested, but will now experiment with a lower temp. I’ll let you know how this works out for I’m sure I’m not to only Paleo baker that has experienced tunneling. I tried this in the oven and it turned out WONDERFUL. I use pumpkin seeds and sunflower seeds since i did not have black sesame at home. I will definitely repeat this recipe. Thank YOU! This is delicious! And my child loved it, but her first words were, “no mommy, i want a big piece of bread!” After i made her try it she asked for more. This was SO easy! I spent so much time and money ordering different GF flours and weighing out grains and finding all-purpose flour and it not turning out. Wish i had found this sooner! THANK YOU! You’re welcome, Keala. My wife and I have found this bread to satisfy all our breakfast and sandwich needs, small, though it is. We sometimes have two pieces since it is a smaller loaf size. Any thoughts on using a bread machine for this? I have three recipes designed for using in a bread machine, so I would check those out first. I don’t know if this would work. I think so, but I haven’t tried. I think it would… might change the texture a bit, but may be even more multigrainy! What other flour, besides almond or flax seed flour, can you substitute with? Absolutely loved this bread, and at the last minute before I tossed it in the oven, I decided to sprinkle our home-made Italian seasoning on top – wow – SO good! Thanks so much for sharing this recipe! I m allergic to almonds- can I substitute the almond flour with any other type of flour? 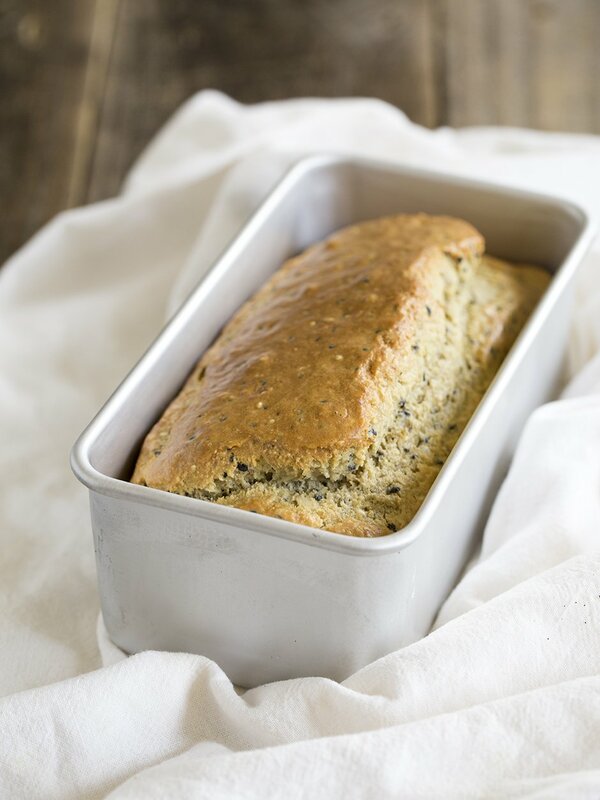 You could try sunflower seed flour… it usually bakes up pretty similarly (although it might turn green with the baking soda, but it’s still yummy when it does that). Thank you so much For your quick reply! I’m going to give it a try today! Almost any nut flour will work. Try Hazlenut flour. You can grind any nut into flour with a dry blade on a Vitamix. 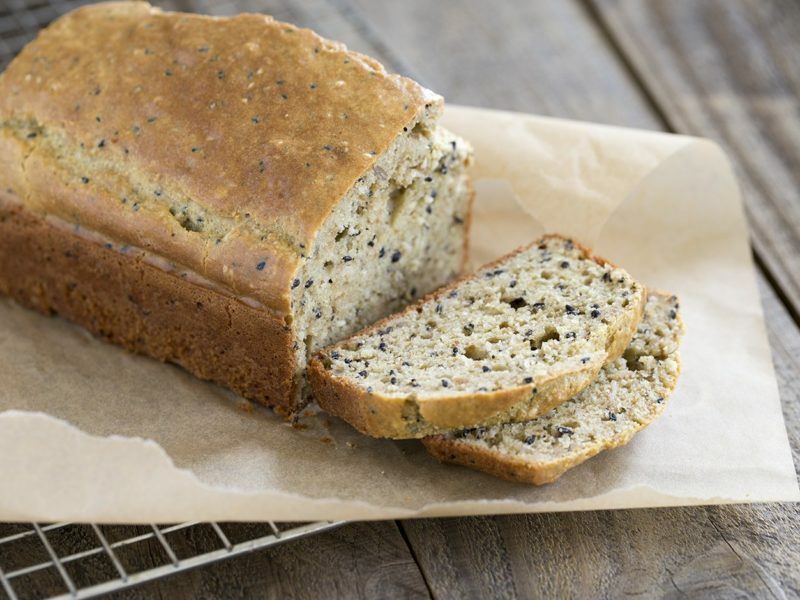 Do you have the nutritional infor for this multigrain bread? 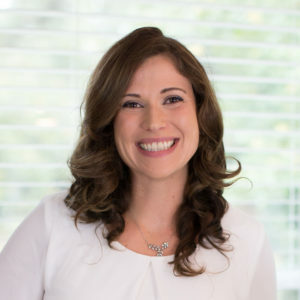 It depends on the fat, whether its isolated or still in the matrix of the whole food (like ground seeds or nuts versus seed oil or nut oil), and the phenol content of the fat. But generally, it starts at the smoking point of the fat, which for a very fragile isolated fat might be 225F. Baking typically reaches an internal temperature of 160F, so its really a non-issue. I just tried this bread and goodness me – it’s amazing. 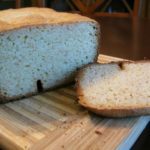 I’ve been gluten-free for a few years and now also Paleo, and this is the best bread recipe I’ve tried so far (admittedly not all that many but still). Thanks for the great work. Mine is in the oven now as I type this. I noticed it was a bit sticky and thick as I scooped it into the loaf pan. Looking forward to eating it and seeing if my almost 3 year old will go for it too. You are one of my favorite resources for recipes and info, keep up the amazing work! Hi I am definitely going to try this recipe but my oldest child has turned SUPER fussy and will not eat anything that has seeds in it or any crunchy stuff – wouldnt eat a beautiful banana coconut bread as the chia seeds had added crunch to it (even though they had soaked up the moisture and turned gel like they still had a litttle crunch about them) – soooooo could I use something other than the sesame seeds or just omit them – will this change the consistency of the bread??? My son used to be such a fantastic eater and now has turned so fussy I am pulling my hair out with what to give him!!! I was wondering, could you use a breadmaker for this recipe? No… check out my three yeast-based Paleo bread recipes instead. Amaaaaazing! Just made it today, it’s great. I’ve also made a few Paleo bread recipes – this is right up there. That’s no small feat! I used tapioca instead of arrowroot- turned out great.I love the springy texture. Next time I’ll increase the volume of ingredients to try a bigger loaf. I have been doing Paleo for a few weeks now and just baked this bread for the first time. Sooooo much better than I thought it would be! Really yummy! My high school son just came home from school and wanted to try it. He loved it. Even said, “It has a cool texture.” That’s one thing I was worried about. So excited to try more baked goods! Just wondering, for those that want to avoid the flax, can ground chia seed meal be used instead of the flax meal? So… I must be the biggest ‘grain free bread’ dummy ever. I have been baking grain free for almost a year now but trying to get my family on board means finding a bread recipe that they will eat. This is the second one in a week that has not performed for me. It was thick and gluggy/sticky when I put it in the pan and after 40 mins was golden brown, didn’t rise a single bit and was still wet inside. What did I do wrong??? Why can’t bread recipes for the oven be made in a bread maker? I just purchased one and I need to know how to adapt a recipe for the machine. I made your yeast-based bread…my husband and I love it! (He’s quite surprised that gluten free doesn’t mean calorie free!) Can I add walnuts, cinnamon, etc.? What would you use in place of almond flour or coconut flour? I’m allergic to both, so have no idea what to use for most Paleo recipes. Is the amount of arrowroot powder correct, 3/4 of a cup? Thanks! Most recipes I’ve tried only use teaspoons if arrowroot. That sounded like a lot. 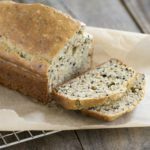 Do you have any ideas for a nut free bread? Our school is nut free but my children still love sandwiches. My family and I have been doing Paleo for the past month with great success..BUT I REALLY MISS my bread, as does my 4 yo son! I want to try this but finding almond and arrowroot flour near me is hard..I could buy it online but I do have Gluten Free Flour..could I use this in place of the almond/arrowroot flours? I don’t know how that would affect the texture or flavor, but you could try. Hmm..I’ll give it a try and post back with the results. Thanks for your quick response. 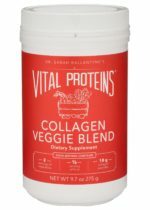 has anyone tried to add chia seeds to this recipe? Could I substitute coconut flour for the arrowroot powder? I’ve done this in most other recipes with great success, but this calls for a larger amount of arrowroot powder, so I wasn’t sure if it would be a wise substitution? I’m trying to make this right now and it does not have a “batter” consistency. Its very much a dry mixture. I substituted coconut flour for almond flour. Could that be the reason?? Yes, that could be the reason. When subbing coconut flour for almond flour, you usually sub 1/4 the amount. This is fantastic!!!!! 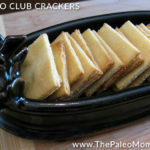 I have made SOOOOOOOO many “Paleo” breads and this was by far the best! I think your recommendation of beatin the eggs is what helped make it lighter. And the taste was perfect!!! I love the taste of thus bread, but mine did not rise at all. This was a wonderful loaf. However, the taste of egg is a little much for me (not nearly as bad as in the nut-free Paleo loaf!). I made them both today and both look beautiful! I’ve been researching the use of egg substitutes; 4 eggs seems to be overpowering in taste for me. I read 1tsp of yeast and 1/4c warm water is a decent sub. I’ve looked over your yeast loaves, but enjoy the simplicity of the ingredients and method in the multi-grain and nut-free loaves. In your experience, what do you think about the reduction of 1-2 eggs for yeast in these preferred loaves? I’ve never tried that as a substitute so I have no idea. Can i leave the honey out? I do not want my bread to be sweet. Where do I find 7.5 x 3.5 loaf pans? I’ve tried Bed, Bath…, William-Sonoma and Amazon. Google 7.5 x 3.5 loaf pans and you will find several sources. You may have to accept 7″ x 3″. Ok. Freaking out here a bit. I pinned this recipe and have made it many many (many) times. It is my favorite. I add seasonings to get flavors and for holidays, walnuts and cranberries….it’s so versatile. So first, thank you. So I pinned it a long time ago, and today when I went to click on my pin to get the location to share with someone else I was recommending it to, it came up (website) as “keyingredient.com” and not your site. I’m wondering if you did that or if ‘keyingredient.com’ hijacked your recipe? I would rather it took me to your page than theirs. I didn’t register for theirs (required to get to the recipe) and came back to yours via a search. I don’t want to re-pin because all my notes of how I’ve changed the recipe to get various versions are under that one and I don’t want to lose them but I PINNED it from your site. It has taken me to your site every time until today. How does that happen that it just hijacks and takes me to keyingredient.com? Thanks for any info you have on this. I’m sure it’s fine but just in case wanted you to know that it’s not taking me to your site now….so how do they do that and have they got your approval? You should get credit for this recipe…not them. IMO. It is my staple bread recipe. I only have a 9 x 5 x 4 inch bread pan. I want to try to use it, but I am not a baker and have no idea how to adjust the measurements…can you help? What about baking time and temp? Thrilled to have this recipe! It is wonderful. Made my first loaf last night. I did use a standard sized loaf pan, so it wasn’t quite as high, but it turned out perfectly. Actually I love the texture!!!! For dinner we ate it as an appetizer with a roasted red pepper/artichoke spread. This morning I had TOAST with my eggs! Thanks a bunch!!!! I am a huge fan by the way. Appreciate all your wonderful kitchen help and brilliant recipes! I subbed tapioca starch for the arrowroot powder and poppy seeds the for sesame seeds…It was amazing! I haven’t had bread in months! Excellent! Used for sandwiches and toast. Can I substitute the apple cider vinegar for anything else, im allergic to sodium metabisulphate? I’m also allergic to metabisulphites so I just substitute lemon for the apple cider vinegar – seems to work fine! 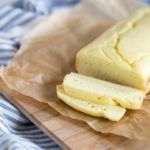 After 15 evolutions from the initial Elena Amsterdam’s bread, I have developed a Paleo/gluten free bread that finally satisfies me and my family. I use a Zojirushi bread maker. Dry ingredients: Almond flour (2 1/2 C), Sorghum flour (1/4 C), Coconut Flour (1/4 C), Tapioca Flour1/2 C), Arrowroot flour (1/4 C), Ground Flax (1/2 C), Xanthan Gum (1T), Dry Yeast (1T*), Salt (1 1/2 tsp*). ( The salt and yeast are added later: *) Wet ingredients: 3 eggs thoroughly beaten, at least 2 minutes, Coconut oil (3T), Raw Honey, including propolis, (3T), almond milk (1C), water (1/2C). Mixing directions: Mix all the dry ingredients thoroughly except the yeast and the salt. Separately beat eggs, add coconut oil and continue beating. Heat the almond milk, water and honey to 110 degrees. The honey will melt into the water/almond milk mixture. Add to the egg/oil mixture and stir to mix. Place the wet ingredients into the bread maker. Then add the dry ingredients to the bread maker on top of the wet ingredients. What cycle do you use on the Zojirushi?? I read that baking with almond flour and flax seed, heating it up, creates inflamation in the body, for it’s omega 6 that is not suppose to be heated up! What is the nutritional information per slice, please? I am allergic to almonds. Do you have any suggestions for what I could use instead? Cashew flour, pecan flour, walnut flour, pumpkin seed flower……..
How much is a cup in grams? or shall I just measure out any cup?? I know that this is old but…..I always use: 1 tbsp flax seed meal to 3 tbsp warm water per egg. It’s a great egg substitute. I just tried this recipe. I just wanted to let others know I didn’t have flaxseed (which is linseed ground up), so used chia seeds instead. I couldn’t get my little processor to give me a chia meal so chucked them in whole used an additional 3 tbs of water and it turned out really well!! I also didn’t have black sesame so the black chia gave it that multigrain look. The next time I try it I will try omitting egg altogether and use the 1tbs chia + 3 tbs water per egg replacement. I will let you know how I go. I would love to know how your egg substitution went-I cannot have eggs. Ok, I’m having some serious problems with this recipe. My eggs didn’t get “super thick” which is so arbitrary that I decided I must be going for pudding consistency but I didn’t get that but instead something more like cream despite beating for 10 minutes. My bread also didn’t rise much and I ended up with a stout, dense bread with a very hard crust. The taste and texture were ok, but I can’t see making this into a sandwich as that’s what I’m trying to do so my son can still have sandwiches at school. I had a similar problem. I’m at 7500 feet, so it might very well be the altitude. I may increase the vinegar and baking soda and add just a touch of water so it’s not so dense. I will say, though, that it was DELICIOUS, especially after 3 years of no bread at all! Absolutely amazing ‘bread’ – no way am I ever going to long for that old piece of regular bread an marmite/cheese again! I tried making Paleo bread in my bread machine. It seems to not get quite done, especially in the middle. Is there a trick to it? I also followed my breadmaker instructions. I made your Zucchini muffins. With a family of 4 they did not stick around long. Thank You! Is arrowroot allowed on the autoimmune protocol? My son follows the Specific Carbohydrate Diet which has done wonders for his UC. Afraid to try something not allowed on that diet…. but wondering if it might be okay. Paleo is usually stricter than SCD – no dairy and no legumes are 2 examples of it being stricter. Arrowroot is a tuber so is Paleo but is NOT allowed on SCD because it’s loaded with starch which is food for the pathogens that the SCD is trying to control. Maybe a silly question, but is there a reason for the brown and black sesame seeds? Could you substitute regular sesame seeds? I think there are different levels of antioxidants based on color (i.e. black sesame seeds containing higher levels of antioxidants than brown). But beyond that I haven’t found much difference. The different colors would give the bread more of that “multi-grain” appearance. I want to make this for myself and my fussy three year old. When I tried to make it (as per receipe) the mixture was like sticky dough and when cooked was very hard. Any suggestions as to what I did wrong?? 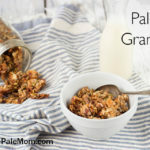 Is sorghum flour aloud in the paleao diet? Technically, no. Sorghum flour is a grain from a species of grass that is related to sugar cane (though it looks and pops like little tiny corn), so, by definition would not be Paleo. It is, however, gluten free, so, if that’s why you’re changing flours, it’s an option to use on occasion. It has the same downside of grains in general (i.e. not as nutritionally dense as veggies, fruits and meats and its high starch content can spike blood sugar). This bread is amazing!! But does anyone else have a problem with it turning green the day after?? What am I doing wrong? Just took a loaf out! House smells lovely. I only had a 8.5x 4.5 pan, so its a little flat. May be a little dry. I went 32 minutes, could probably left off the last five. Taste is nice, texture a little like corn bread. I used unhulled brown sesame seeds, was not sure if hulled or unhulled mattered, i tried to toast a bit – ha ha, they pop like corn. I thunk i may try a double batch in the same pan and add 5 minutes to see if i can get a more standard loaf. Anyone tried this? Also mine stuck in the pan, thought i used enough coconut oil, but probably will add parchment paper next time. Anyone have tips on this? This bread looks delicious! Just wondering though – what’s your view on soaking grains, seeds, nuts etc beforehand? Can you please post the nutritional info per slice! I eat this every day and love it 🙂 Thanks! Any suggestions on what to use instead of arrowroot (and tapioca) powder? I’m on the GAPS protocol and those are not allowed. I really want to try this too. Thank you. That’s awesome – I did the same thing to Elana’s recipe, except I used Sunflower, Golden Flax, and Pumpkin seeds. (It was what I had on hand.) It’s still the tastiest bread I’ve made since giving up grains! I also added some further ground seeds to the top of the loaf for texture. Alternatively I can use almond meal, but I don’t have any almond flour. I made the recipe yesterday but doubled the ingredients due to not having a pan to the specific size. It turned out well and toasted quite well this morning but suspect it may be a little more dense than it should be. The problem could well be that I am Australian and our measurements are different from US and UK for that matter. imperial and/or metric measurements would be great. Is it possible to provide the recipe this way. I found reference to 1 cup being 236.5ml which is fine for liquid but what about the almond flour (I found a note that 5ozs equals 1 1/4 cups for almond flour) which I assume would be different from the weight of the arrowroot and the flaxseed would be different again. I could calculate from the base if they were all the same. I doubt the amount of the sesame seeds and sunflower seeds would be particularly significant to the density but I feel I may have over estimated the almond flour, hence the density. I do have a recipe for a Chia and Almond Bread which I would be happy to share if anyone is interested. It is really nice and toast quite well too. I have found that the bread recipe that contain oils don’t turn out particularly well – not for me anyway. Im looking for Paleo Mom’s kalamata olive bread. Where can I find the recipe? THIS WAS ABSOLUTELY AMAZING!! I had almost given up on making anything my 7-yr-old could enjoy to any degree, but he is going to LOVE this. It’s better than Ezekiel bread which is what I’ve missed the most. Oh, and my daughter too, she won’t have to live without the Ezekiel morning toast satisfaction anymore, so thankful!!! I just wanted to thank you for such a great recipe for bread! Here in O.Z, a cup measures 250 which I didn’t realise was different until I was reading the comments but it didnt chang the outcome . I did have to sub some ingredients I used 1 tablespoon of maple syrup instead of the honey, 1Tbls white sesame seeds, 1 Tbls golden flaxseeds, and tapioca powder instead of arrowroot. I also greased my pan with butter. My loaf pan was larger than your measurements and although bread is about half the size of a normal bread slice, it tastes AWESOME!!! My 13 year old and 3.5 year old both love it and its wonderful to have some bread or toast after 6 months! JFYI it freezes well too, YAY! Woot! So glad you liked it!